from tasting sessions while travelling. This outlet with a seating capacity of around 200 people oversees the mansions of Jubilee Hills. If a dinner date is on your mind, this place with dimly lit indoors, and lantern-adorned outdoors is a good fit. The management encourages artists by displaying a new work every month. ai?? ?If any piece of art catches your fancy, you can buy them as well,ai??? informs Deshmukh. The property has two outdoor wings, an indoor one, and even a secluded room for parties. The tagline, Escape to Malaka, seems accurate. The staff, cordial and welcoming is ever eager to explain the nitty gritty of what goes behind the making of every dish. They suggested that we begin with the Malaka Thai Ice Tea. This refreshing concoction with lemon grass, cinnamon and some Milkmaid is what one needs to beat tiredness or heat. The restaurant also boasts of a seasonal menu, apart from the set one. The recipes here are a result of rigorous research with copious trial and error. The sauce platter is extensive as well ai??i?? sweet chilli, peanut, tomato salsa, sambal and more. The chefs here donai??i? ?t use canned coconut milk in their Thai curries ai??i?? it is prepared in-house. We started with two chicken soups ai??i?? Tom Kha, with a coconut milk base and Tom Yum with a hint of galangal, and lemon. 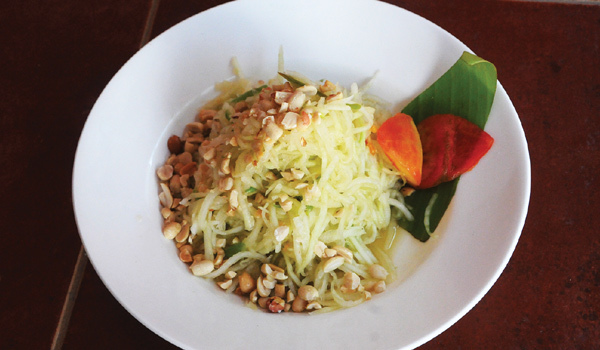 The Tangy Green Papaya Salad with peanuts was well made. Next came the vegetable Murtabak, miniature stuffed puffs with beans and carrots. This Malaysian-inspired dish along with their signature starter Top Hats (delicately fried cups with minced vegetables topped with sprouts) and pumpkin chips were novel and appetizing. The signature Thai Mutton Chops was soft and juicy, lightly peppered with spices. For the main course, we tried the cashew-laden chicken curry, Kari Kapitan with Roti Jhala (aesthetically pleasing net crA?pe) with Sambal Crunchy Vegetable. The chefs here pay keen attention to the aesthetics of the food ai??i?? the Roti Jhala is a case in point. We finished our meal with two dessert variants ai??i?? Malaka Magic Choco Lava and the Date and Coconut Roll. We recommend that you try the latter, because of its distinct flavours, and the melt in the mouth ice-cream.Ai? ?Price for 2: RS 1400.